Cleaning: 1000 rpm max, 3.4 Cu Ft. The Bosch Axxis WFL2090UC is a front-load washer that comes in a stackable unit and uses a snag-free stainless steel drum. It is equipped with sensors, 15 washing programs and 4 washing options, also has its own internal water heater. It works quietly at 54 dBA silence rating for washing and 73 dBA for spinning. Set the right water level and temperature through SensoTronic Plus. Ensure energy efficiency with its Energy Star certification. Have up to 15 washing programs and 4 washing options to choose from. Use warm water for thorough cleaning with its internal water heater. Save on space with the stackable unit. Ensure water extraction and less drying time with up to 1,000 rpm max speed. Benefit from tough stain removal by using the Temp Boost Cycle that heats up water up to 140F. Make sure that clothes are free from excess moisture using the Spin Cycle. Soak soiled clothes first before you run the cycle with the Soak option. This compact washer has numerous features that help ensure fabric care and an efficient washing system. It works quietly in the background and does its job efficiently, especially when the right washing programs and options are set. It saves not only on energy use but also on water consumption, unlike other washers, which require more gallons of water. The stackable and compact design also makes it a good fit for apartments and homes with small laundry area. What consumers also like about this washer is that the settings are adjustable. It can remove stains and prevent wrinkles, which reduces time spent for ironing clothes. When features are chosen and used properly, the unit can ensure thoroughly cleaning and rinsing. The spin cycle effectively removes excess moisture, and the internal water heater makes sure that the laundry is cleaned well. The unit is also durable as it uses a snag-free stainless steel drum and is also equipped with sensors and easy to use programs. 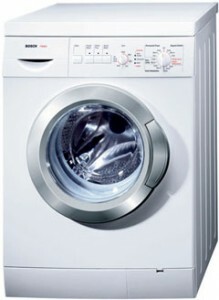 Common complaints about this compact washer is that some cycles take too long to finish and it has a tendency to move. It is also quite expensive, as you can find washers with the same capacity, size, and almost the same features at a cheaper price. The parts are also limited, especially when going to independent repairmen for maintenance. The best option is to opt for the manufacturer's service. Although it looks nice, the limited color option is also a disappointment for some, along with the small capacity. Some also have difficulty using the manual. Anyway of getting rid of mould on the rubber? I have owned washer for two years and it has started to leak water from the underneath of machine. Any ideas? did we buy a lemon ? i can believe this was bosch's response -- live with it. do we have a lemon, or have you had the same exp? This washing machine came with my condominium, and was brand new when I first began using it. Like any major appliance, it has its positives and negatives. This is a space efficient front-loading machine, so it can't handle very large loads. It usually takes around and hour to an hour and fifteen minutes for it to finish a load of laundry. However, as I mentioned before it doesn't take up a lot of room, and can handle being the bottom of a washer-dryer stack. On the positive side it generally does a satisfactory job of cleaning my clothes. I have put some very dirty clothes in it and they have always come out clean. It does have many different settings for wash temperature and time. Furthermore, it gives you the ability to run individual cycles (such as spin or rinse) if you would like to. I have had some negative experiences with this washer. Occasionally, the water will not drain properly, and the clothes will be very heavy with water when the washer is finished. I end up having to manually open a valve on the front to drain the water, and then run the spin cycle to finish the load. This generally happens only with heavy loads such as towels. I also have a suspicion that the washer is tough on my clothes. It seems like I lose a shirt every couple of months with a tear in some part of it. While I can't directly pinpoint the problem to the washer, I do believe that it has something to do with it. The final point I have about this washer is that it can be loud. I have to shut the door to keep the spin cycle from being an annoyance to everyone in my place. In summary, I will likely not purchase a similar model for my next washing machine. I would recommend it for someone who doesn't have a lot of laundry. It is space efficient, so if you have a condominium and not a lot of people contributing laundry then it makes a satisfactory choice. However, I cannot recommend buying one. My Bosch washing machine has not been good at all. Motor (spin) had to be replaced 3 years after purchase. Maybe I put too much in machine, so machine worked harder, maybe. Now appliance tech told me the control panel has exploded, literally inside the panel. Get new control panel in and it does not proceed through all cycles. It stops before final rinse and spin. New one is on order because it is defective. He was not able to stay through entire wash cycle to make sure it works. Who could? Talked to appliance tech and he said he just serviced another one where the control panel had exploded inside. Do not get this model! Try Miele. I have had pretty good success with their washing machines. Read with interest your comment about your machine being rough on your clothes for some unknown reason. I am comparing the current compact Bosch Axxis - WAS2016UC with comparable models by Miele and AEG/Electrolux. When running my fingers against the drum in a "reverse" direction, I noticed that there is a rough "cheese grater" effect which is not the case with the other machines. I haven't checked the full-size Bosch models to see if the drum is engineered in the same way, as it's only the compact version that I want. If it weren't for this concern, I would have bought the Bosch without hesitation, even though in Canada it's about the same price as the Miele compact (W1612). The salesperson I spoke to was aware of the "cheese grater" effect but did not mention it until I brought the subject up. Does anyone have any comments about the above, as I have found nothing online so far and want to make my purchasing decision. I could increase the use of mesh washing bags to avoid any snags but shouldn't have to in this calibre of machine.